The injuries keep on piling up for the Edmonton Oilers; one of the latest victims was center Ryan Nugent-Hopkins. I briefly mentioned in my last post how there had been much discussion about RNH and if he was expendable. Leon Draisaitl has been emerging as a number one center and generational talent Connor McDavid returns after the all-star break, giving the Oilers two viable options at center going forward. By a stroke of bad luck, Oiler fans are going to get a look at what this team will look like without the one they call Nuge. It’s not going to be a pretty sight. Already, the Oilers have gone 0-3 without RNH in their lineup. It will get better with McDavid’s return, but Nugent-Hopkins doesn’t get enough credit for what he does on this team, and I want to further that point by discussing his offense and his role on this team. RNH is on pace for 52 points over the course of a full season, which is slightly below the close to 60 point pace has achieved the last two years. He improved last year before taking a step back this season. His lower shooting percentage and the Oilers PP woes (26th in NHL) could explain for some of the regression in his stats, however I believe there is another, more impactful reason. The above chart shows the Oilers 6 top forwards in terms of CorsiRel QoC, the number indicates the time-on-ice weighted average corsi of his opponents relative to their teammates. Basically, his opponents on average will produce 1.435 more corsi events in their team’s favor than one of his opponent’s teammates will. RNH’s CorsiRel Qoc is 2nd on the Oilers, meaning he is on the line facing the opponent’s top players in terms of possession. This is nothing new, as RNH has finished 2nd or higher in CorsiRel QoC the past 3 seasons as shown below. However his CorsiRel QoC has increased by 51% this year, a staggering number considering he has consistently been in the top two in this stat. He is facing the top competition more often this year than ever before. If you look at the names on his even strength against you statistics here, the players he has played against the most (E. Staal, P. Kane, Gaudreau, Hjalmarsson, Giordano, Ekman-Larsson) fall in line with his CorsiRel QoC. Furthermore, comparing those players to the players he played against the most the two years before (Marleau, Cogliano, Vrbata, Ekman-Larsson), there is a visible increase in the quality of player he is facing this year. I would argue this indicates that Nugent-Hopkins has changed roles to more of a two way center. This is the benefit of having Ryan Nugent-Hopkins on this team, he is able to face top competition night in and night out, while still providing some offense. He may not be posting great offensive numbers, but this Oilers team is weak defensively, and RNH is treading water. He has posted 2nd line offensive numbers doing it (132nd in NHL in pts/60). Using RNH in this way frees up Taylor Hall, Leon Draisaitl and Connor McDavid to play against slightly weaker competition. If anyone still thinks that RNH is expendable because of McDavid and Draisaitl, there are a few reasons it is a bad idea to give up RNH to fill a need on defense. If one or two centers get injured, the Oilers will once again lack quality offensive depth. This is currently a problem, as I said earlier the Oilers have lost every game in which McDavid and Nugent-Hopkins have both missed. Hall and Nugent-Hopkins have posted 3.0 GF/60 together and Nugent-Hopkins and Draisaitl together have a ridiculous 5.21 GF/60. The Nuge/Draisaitl number is on a small sample size and would decrease, but it is not improbable that it settles somewhere near that 3.0 range. Jordan Eberle is a good offensive player who can be moved for a defenseman. He may not get you as much of a return since he is a winger, but he has posted three 60+ point seasons already and will bring in something good. Adding to this, he has been thrust into the two way role with RNH, but Eberle has not fared as well against the top competition without RNH. As is shown in the chart above, the Oilers are not scoring enough 5v5 goals with Jordan Eberle alone in a two way role. I believe he is the better candidate to be moved for defensive help. Ryan Nugent-Hopkins should be a key piece of the Oilers going forward, he is only 22 years old and locked up for 5 more years. Already he has played 304 games and has 218 NHL points, and he is still developing. Players like Pavel Datsyuk and Joe Pavelski were just entering the NHL at 22, and it took them a few years to become the players they are today. If the Oilers hope to win championships, they are going to need to keep players who do a lot of things right and provide value at their cap hit. 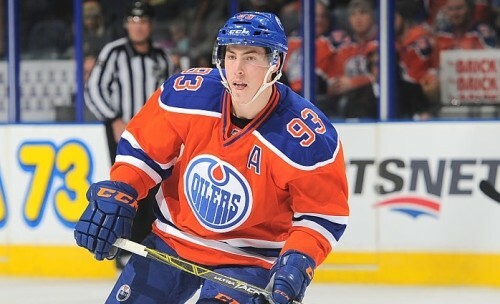 Ryan Nugent-Hopkins is one of those players and that’s why he is important to the Edmonton Oilers. Born and raised in Edmonton, I am a lifelong Oilers fan. A graduate of the University of Alberta, I am an engineer by day and at night can be found playing and watching numerous sports or going to catch a concert.